Welcome to the latest installment of Jack & Mimi’s Cheap Date. Here are the rules: Each week, my girlfriend Mimi and I go somewhere in the Tacoma area for a cheap date where we spend $20 or less. (This does not include tips because service is unique and can’t be universally quantified.) Sometimes we succeed. Sometimes we fail. There are places in Tacoma that I feel are so well known and so legendary that there’s no real reason to tell people about them. Then I remember that not everyone who reads this is from Tacoma and that there are likely still some people who do not know the awesomeness of Pho King. And more importantly, I really felt like Pho King after spending most of the day in Jury Duty. Pho King is located near the corner of South 9th and MLK Way on Tacoma’s Hilltop between the Hilltop Pawn Shop and a photo developing place that is mysteriously still in business. Mimi and I arrived at the end of the lunch rush and found one of the only remaining tables. We were quickly given menus and two glasses of water. Looking over the menu it was easy to find items within our Cheap Date price range. We could have each had large orders of Pho, but we already know how good the Pho is at Pho King. Instead I opted for the Pho King Special Plate for $7.75 described as ‘Grilled pork chop, julienne pork, Vietnamese meatloaf, crispy fried shrimp, fried eggs, pork sausage, and shrimp wrapped in bean curd skin’. Mimi chose the Vegetarian Rice Dish for $7.50 described as ‘Lemongrass tofu and veggie egg roll.’ She also chose to get a Thai Iced Tea. The food showed up a few minutes after we ordered. It was somewhat surprising how quickly they got our food done given how busy it was. Mimi’s dish arrived first. It looked so good that she almost immediately started eating but remembered we needed to take a photo. Luckily my food came out only a minute or two later. I took a photo and we dug in. 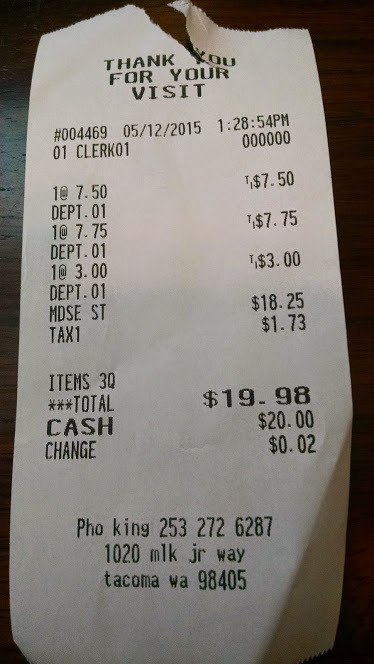 Then it came time for our bill. My math said that we’d be close once tax was added in. Here’s the receipt. To the surprise of no one who has ever been there, Pho King gets an enthusiastic endorsement for a Cheap Date. Do you know of a place where Mimi and I should try to spend $20? Email me at jackcameronis@gmail.com and let me know. 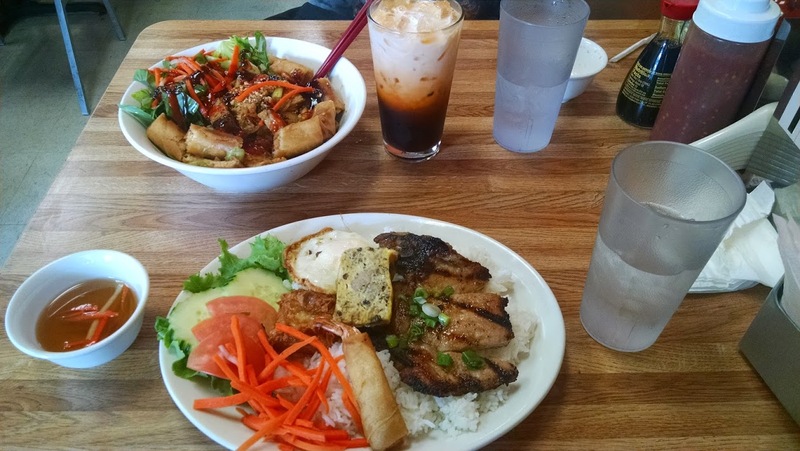 This entry was posted in Jack & Mimi's Cheap Date, Tacoma Places and tagged Pho King, Tacoma Restaurants. Bookmark the permalink. I understand you closed comments on the suicide of Izabel. But I wanted to THANK YOU for writing about it in the way you did. Shaming doesn’t teach, it hurts and harms. None of us have ever learned from being shamed and disrespected, especially by those who say they “love” us. Thank you for your courage in speaking the truth.